Recent reports and revelations have conclusively shown that the Rudd Labor government is using the Northern Territory Emergency Response (NTER) policy to dispossess Aboriginal people. Under the Australian government’s “emergency protection measures”, the situation for Aboriginal people in the Northern Territory has become worse. The government and the corporate media then blame Aboriginal culture for the dire situation, rather than the government’s own systemic neglect of the provision of adequate services, and the resulting extreme poverty of Aboriginal communities. At the Council of Australian Governments meeting in Darwin on July 2, Indigenous affairs minister Jenny Macklin released a report titled Overcoming Indigenous Disadvantage. The report, compiled every two years by the Productivity Commission, measures 50 economic and social indicators of disadvantage between Aboriginal and non-Aboriginal Australians. The latest report found no improvement in 80% of the indicators for Aboriginal people. They live in greater poverty and have poorer housing, poorer education and poorer employment prospects. 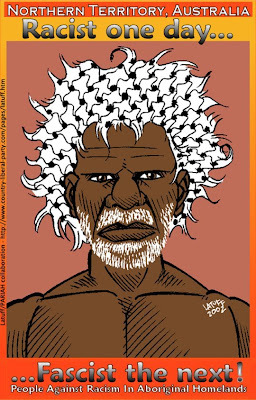 Aboriginal people die on average 17 years younger than non-Aboriginal Australians. Aboriginal children under four years die at three times the rate of other Australian children. More Aboriginal people in the NT are being imprisoned. Aboriginal people are 13 times as likely to end up in jail as non-Indigenous people. The imprisonment rate for Indigenous women and men has increased by 46% and 27% respectively since 2000. These increased rates not only reflect a racist system in which police more readily target Aboriginal people, and judges more often impose prison sentences on Aboriginal people. It is also due to Aboriginal people in the NT being jailed for minor offences under new NTER laws that apply only to Aboriginal people living in town camps or remote communities. Capitalist politicians and the corporate media have justified the racially targeted NTER laws by citing high rates of substance abuse, violence and child abuse. These are realities in many remote Aboriginal communities, but are not due to some cultural or genetic quirk. All around the world and in pockets of Australian cities, the same social problems at similar rates can be found among non-Aboriginal people. Contributing factors include poverty, a sense of hopelessness, the sexist values of capitalist society and higher than average rates of imprisonment, especially when any of these factors are combined with overcrowded housing. The 2004-05 National Aboriginal and Torres Strait Islander Health Survey estimated that 127,546 Aboriginal people aged 18 years and over lived in overcrowded households (one or more additional bedroom required). This accounted for 27% of all Aboriginal people aged 18 years and over. There were around 1 million other Australians living in overcrowded households in 2004-05, 5% of all other persons aged 18 years and over. Approximately 14% of Aboriginal people were living in households that required two or more additional bedrooms, compared to 1% of other people. The same survey found the NT had the highest proportion of Aboriginal people aged 18 years and over living in overcrowded households (65%). Moreover, the federal and NT governments have refused to offer new housing or services unless Aboriginal people sign 40- to 99-year leases handing their land to both governments. If there were genuine concern about Aboriginal poverty, these governments would fix housing in communities that governments have neglected for decades, without any demands. But the priority of these capitalist governments is the theft of Aboriginal land. The July 6 National Indigenous Times reported on leaked documents revealing that Macklin was advised by her department against formally consulting with Aboriginal people over the compulsory acquisition of their land because it would be “too expensive”, would tie up too many resources and was unlikely to get the outcome the government wanted. The advice was “read, agreed and noted” by Macklin on March 26, just one week before the government endorsed the UN Declaration on the Rights of Indigenous Peoples. Some of the documents focus on the NTER legislation and a much-publicised promise by Macklin to amend the laws to comply with the federal Racial Discrimination Act (RDA). The NTER legislation remains the only federal law exempt from the RDA, allowing a host of racially discriminatory government actions, including the compulsory acquisition of Aboriginal land. When the NTER began, the federal government said it was compulsorily acquiring the land to prevent any delay in the provision of housing. Macklin was also warned that if she brought the NTER legislation under the RDA, there was a “significant risk” the compulsory acquisition of Aboriginal land would not survive a court challenge. The federal government is using the threat of acquisition without compensation to push Aboriginal communities to sign the leases. Those communities that were able to resist the pressure may be able to challenge compulsory acquisition of their land when the NTER laws are made no longer exempt from the RDA in either September or October. However, Macklin has been told by government solicitors that “some minor legislative amendments” to the NTER act will reduce the risk of court challenges. The pro-capitalist Rudd government hasn’t built houses in remote Aboriginal communities in over two years with a budget of nearly $700 million. Compare this failure with socialist Cuba, a poor Third World country, and how it is meeting its housing problems. Last year hurricanes hit Holguin and Las Tunas, two of Cuba’s eastern provinces, destroying many houses. In Holguin, 53% of the more than 124,000 houses affected have been rehabilitated or reconstructed. In Las Tunas, hurricanes Ike and Paloma damaged more than 80,000 homes, of which 32,000 have been totally restored. Cuba can do this because it assigns resources according to social need, not according to the profitability of capitalist businesses. Equally great picture - worth several thousand words. I would like to use this picture. How do I get permission, and whom do I acknowledge as the artist? The picture is by Carlos Latuff a Latin American artist/activist who was asked by PARIAH (People Against Racism In Aboriginal Homelands) to do an artwork. Latuff claims no copyright on his work preferring to get the message out. If you want to be extra sure about permission ask PARIAH. Thanks Bro, save a palm tree for me.